Both the chrome and the stainless steel café banner solutions are available in three banner materials; PVC, Mesh or Artex® Canvas, with plain or digital dye-printed printed banner options. The heavy weight PVC banner is available in either plain or customised graphics. PVC banners are water resistant, hardwearing and wipe clean. 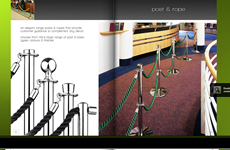 With a durable high shine finish the PVC banners are well suited for indoor and outdoor use. No standard colour limitations, the PVC banner is available in any pantone colour, at no extra cost. 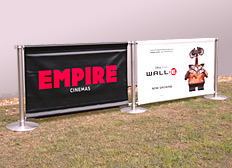 Tensator’s mesh banners are easy to handle yet ultra-strong and designed to withstand the harshest weather conditions. The water resistant, wipe clean banners are apt for use outside and as the mesh material is perforated it allows airflow through the banner, making the banner option perfect for high wind locations. No standard colour limitations, the Mesh banner is available in any pantone colour. The Artex® canvas banner is a premium durable banner option, it is hardwearing and machine washable, making it a perfect solution for all environments. No standard colour limitations, the Artex® canvas can be digitally dye-printed to meet specific pantone colours and full colour graphical designs.